I bought a $40 raft (Intex) from Clark Rubber and reinforced it with a layer of poly tarp which can be attached to it with polyethylene tape (from greenhouse suppliers), ‘Gaffer’ or ‘Duct’ tape. You could also use tarp clips if you prefer. This makes it well-nigh indestructible. The tarps come in three weights: 100grams/square metre, 150 and 200 equating roughly to 4,5 & 7 oz per square yard). It is possible to make a double paddle up with the oars they supply by cutting a thread on the end of the plastic handle – or you can buy a piece of continuous thread of and cut off an approx 2″ length. The paddle is VERY delicate. 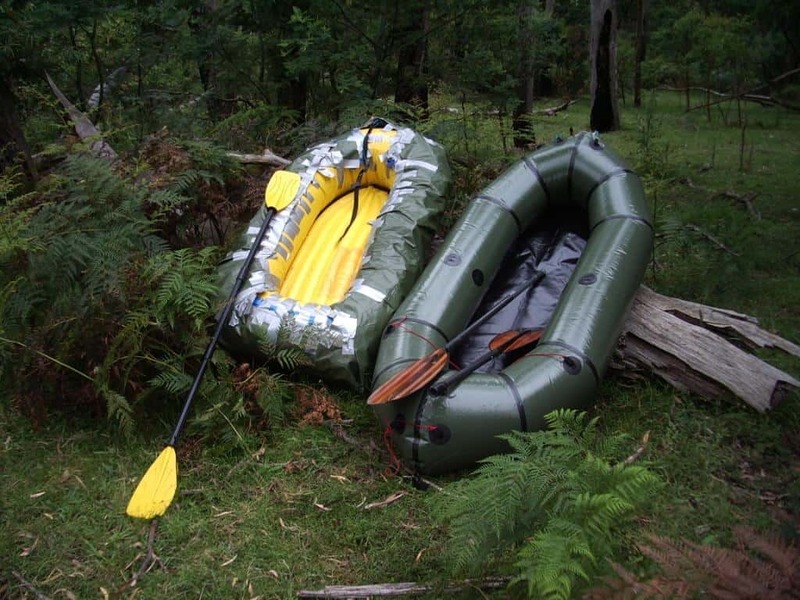 The advantage of such rafts is that they are very cheap and can be stowed in your favourite hunting spot approx 1-2 per 25 litre canoe drum. Then when the need arises to transport some venison out or if you twist your ankle or are just in a hurry to return to your beloved, they come in very handy and are not so expensive if they are lost to a flood or wildfire. You can saw the rowlocks off if they get in your way. 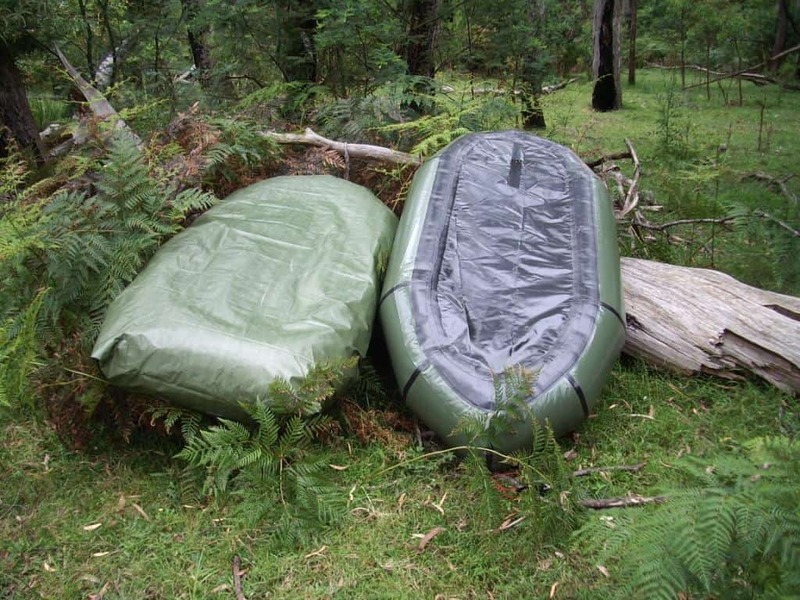 I use my inflatable sleeping mat in the bottom for extra padding, flotation and insulation from cold water. I think they make a very good introduction to packrafting.I do not intend that they should be seen as competition to Alpackas but they might well lead someone on to buying such a more robust raft after they have thoroughly trashed their ‘cheapie’. Faux and real packraft, top view after use. I own an unrigged Alpacka Fiord Explorer which I explicitly bought for that eponymous purpose. I hiked three days in Fiordland New Zealand to just below Loch Marie on the Seaforth River and rafted down the river to the Dusky Sound (or Fiord) in 2009. Not a bad effort for a 60 year old. There were a really lot of people sized sharks in the Fiord so that part of the trip was rather exciting, but the hut at Supper Cove at the end of the trip is maybe the most beautiful place on earth. You can find lots of snaps on Google Earth. There are also at least two rapids which MUST be watched for and portaged. I believe I may have been the first person to solo canoe the Seaforth River but I understand a deer culler with a broken leg was rafted down the river on a tractor inner tube during the 1960’s. I came in from Lake Hauroko. If you came in from Manapouri you could raft down from the Kintail Hut to Loch Marie. I know there are a couple of rapids and a Lake in this stretch but I have not (yet) paddled it. You can paddle across Loch Marie being very careful to avoid the innumerable submerged branches but you MUST portage out of the Loch. There is an immense cascade at the exit. Put back in below the Bishop Burn. An ‘Aerovest’ makes a very cheap, light life jacket though it is not recommended or legal for this purpose. It is certainly a lot better than NO life jacket. It also keeps you warm. You need both the straws it comes with. One to inflate it and one to deflate it to just the right ‘fit’. You could use another piece of tape to attach it more securely. I figure it WOULD save your life. Faux and real packraft bottom view (after use). Further thoughts: I have successfully had an overnight trip on Grade 2+ to Grade3 water here in Southern Victoria using one of my ‘faux packrafts’ as described in my previous posts. I made up a four point tie down for my pack across the bow of the boat with some twine and a 3/4″ belt buckle type plastic clip which are common on packs etc. This worked well if I needed to quickly release the pack to perform portages etc. I towed an empty 25 litre canoe drum behind the raft (attached by another quick release clip) so that I would have somewhere in the forest to safely stow the raft and paddle (against winter hunting use) when I was finished the trip and wanted to walk out. This also worked well. The Gaffa tape held up fine, but I have since thought that some form of clips would work bettter as I would be able to use the tarp as an overnight groundsheet or easily replace one tarp with another. Suitable clips are available illustrated here: http://www.theultralighthiker.com/tyvek-twin-fire-shelter/ for 89 cents each. I use these in creating my Tyvek ‘diamond’ shelters. I estimate that 8-12 would be good and that you would daisy chain them together and tension them with a light cord to hold the edge of the tarp on the inside of the boat. If you felt this was too much to spend, you can use a number of marbles, round pebbles, polystyrene balls (avail. ‘Spotlight’) and fix each in place with a loop of twine (looped over itself and the marble) which you then daisy chain together as beforeas here: http://www.theultralighthiker.com/worlds-lightest-tarp-clip/ I used a heavy duty poly tarp for the bottom reinforcement. After eight hours of scraping over rocks and logs etc there was some minor delamination in places of the outer coloured surface of the tarp. I estimate you would get a number of days’ of rough use out of one $12 tarp. It might even be a good idea to do this with your genuine packraft just to extend its useable life. I took along some Araldite (two part epoxy) glue just in case I needed to fix a broken ABS plastic paddle the raft came with, but as I was careful in using the paddle this wasn’t necessary. It held up to 4 years stored in a drum in the bush quite well, such that I was able to get it out for a trip in 2015: http://www.theultralighthiker.com/not-quite-alone-in-the-wilderness/ and put it back in the drum again against future need. I had some trouble getting just the right sized nut to make into a die to cut the thread on the end of the oar I needed to make it into three section double bladed padddle. I had to use a nut which was only approximately right and finish the thread off with small triangular file. The thread appeared to be almost a 32mm coarse metric thread. I need to do a little more searching to get just the right nut. I made hacksaw cuts on the inside thread at each point of the six points of the nut, and finished off the cutting edge with small triangular file. This worked fine to cut a thread in the soft plastic material, but as I said before, I have to hunt a little further afield to get just the right nut to match the thread on the end of the oar on this brand of raft. You may be luckier with a different brand of raft. Happy ‘faux’ rafting. PS: I have since seen this cheap raft for $A27. I have also seen the tarp for less than $A10, so I was swindled! Happy faux packrafting!